Carnation Footcare is a range of products created and produced by Cuxson Gerrard & Co Ltd of Oldbury, West Midlands and has been taking care of the nation’s feet for over 100 years. Cuxson Gerrard & Co Ltd was founded in 1878 as a surgical dressings manufacturer and has pioneered many new product developments earning a reputation for reliability and quality. The company is a leader in the research, development and manufacture of adhesive coated dressings, specialising in medicated dressings and adhesive paddings for podiatry and medical use. In 1885 Cuxson Gerrard operated from a site in Fountain Lane in Oldbury that later became the main factory until 1995, when they moved to a modern, purpose built manufacturing facility with a research and development laboratory in Broadwell Road, Oldbury, which has helped maintain the company’s position as the leading producer of podiatry products worldwide. One of Cuxson Gerrard’s product ranges is the Carnation range of footcare products, which are manufactured to be sold to the public through pharmacy and retail outlets. 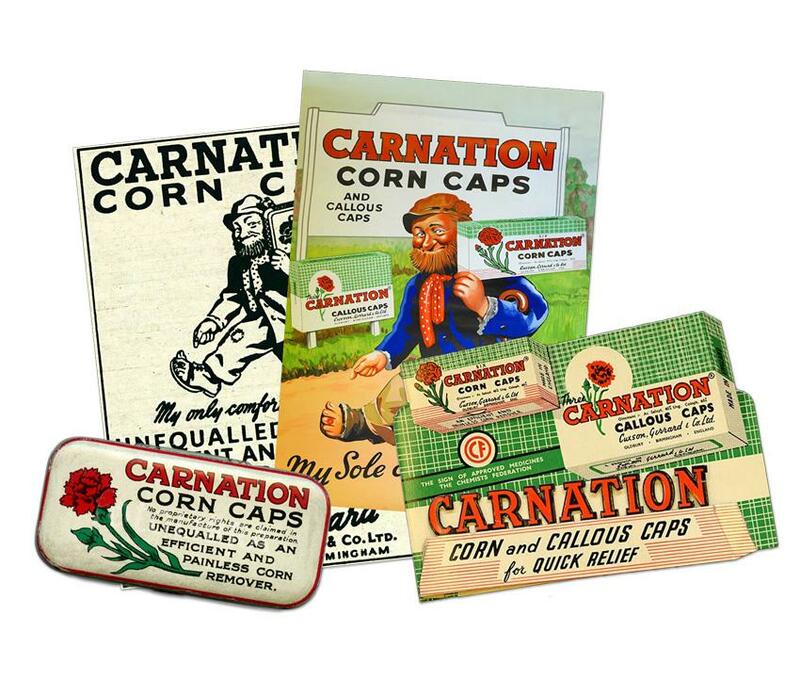 In 1922 Cuxson Gerrard invented the Corn Cap, calling it ‘Carnation’ and the Carnation Brand has become one of the company’s most famous consumer brands. Over the years the branding and packaging have changed as the various pack photographs show. The Carnation Brand continues to prosper both at home and abroad. The range now comprises more than 60 products and is marketed in every continent – apart from Antarctica.